Level VII Ballet is a continuation of the work developed in Level VI. It is here where students will be challenged consistently in their physicality, endurance and body articulation. Students will train pointe work once a week and only by approval of their teacher. Understanding that pointe is a delicate and dedicated art form, only students who present strong skills in their allegro, ankle stability and consistently strong relevé movement patterns will be invited to get a pointe shoe fitting. Students who do not have pointe shoes, will still be strongly encouraged to take the pointe section of the class with soft shoes to develop their skills further. Please note: not all students of this grade level will be obtaining pointe shoes. We promote a very safe and healthy way of training. Will there still be classes occurring the week prior to HCA Celebrates Dance Recital? Yes. 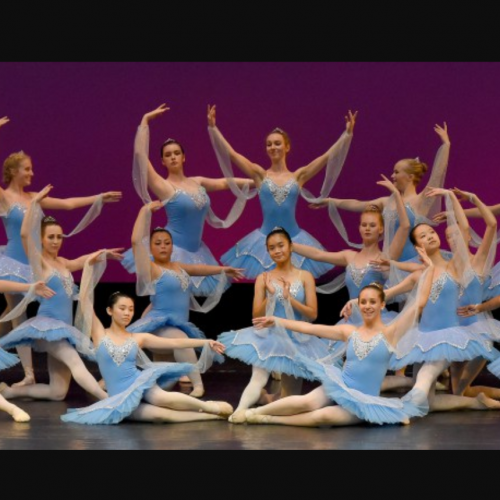 Every year, the dance teacher uses this week to schedule an extra practice the week prior to recital so that the students have time to clean, finalize any last details, and not forget any important information for the show. If you are registered in another type of style of dance such as lyrical or modern that is back to back with your ballet class, please purchase the transition tights). Absolutely no skirts or leg warmers please. If you are transitioning from hip hop into these classes, please inform your teachers and change quickly.